Men on a Mission is for men who desire to grow in their faith, connect with guys, serve in meaningful ways and have fun in the process. Contact Vaughn Kavlie if you would like to be included on the mailing list of events coming up. Men's Softball Doubleheader Game Nights are held on Tuesdays. The Softball Season runs from May - July. Contact Pastor Ben Bigaouette if interested! 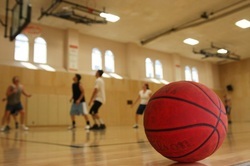 Oak Hill Men's Basketball is held on Monday nights from 8-10pm at the Kennedy Activity Center in Bloomington during the months of September - April. The men's basketball is available to both high school students and adult.